With the release of Roots Architects’ 7″ single “1000 Light Years”, Geneva-based Fruits Records presents its next noteworthy project. The Swiss label’s founding member Mathias Liengme initiated this tribute to the players of instruments in the shadow who built Jamaican reggae in the Kingston studios. This Roots Architects project gathers 50 of the greatest Jamaican session musicians from the 1960s to the early 1980s still playing today. They were brought together in the studio to create an original album of instrumental songs, which will be released later this year. 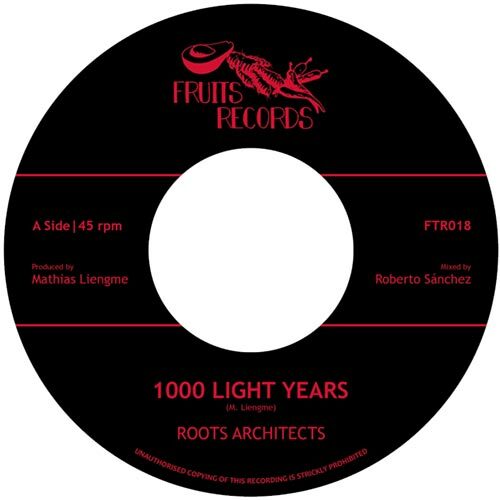 As a forerunner and teaser of that forthcoming full length album, Fruits Records comes up with a 7″ single, which features “1000 Light Years” and its dub version “1000 Dub Years”. The former is an excellent dark heavy roots instrumental played by what used to be The High Times Players nucleus in the early 1980s: Stanley ‘Barnabas’ Bryan on drums, Chris Meredith on bass, Leebert ‘Gibby’ Morrisson on rhythm guitar and Tony ‘Asher’Brissett on piano. They are joined by Dwight Pinkney on lead guitar, Dennis ‘Jah D’ Fearon on organ, Robbie Lyn on Korg polysix, Lloyd ‘Obeah’ Denton on Prophet 12, Calvin ‘Bubles’ Cameron and Everald Gayle on trombone, Joseph ‘Congo’ Sutherland on repeater, and Alphonso Craig on percussions, who nicely spice up the riddim. Expertly mixed at A-Lone Ark Muzik Studio by maestro Roberto Sanchéz, “1000 Light Years” is a majestic piece, pure class!! This also goes for its counterpart, the tough “1000 Dub Years”, a scorcher with a great vibe and a real joy to listen to, especially when played LOUD.